It’s amazing how far a little bit of chicken wire can get you. A community gardening initiative is getting itself off the ground with the help of sundry donations like extra wood and shovels. Grass to Gardens is a project by Concordia grad Jamie Klinger and a group of volunteers who want to see more vegetables growing in the Plateau Mont-Royal borough. The goal is to raise as much money as possible in the next few months so the gardens can be built and planted by spring 2015. “It’s a way for people in close proximity to get to know each other and offer to help out a project—and to plant gardens and receive a portion of the vegetables for their time and effort,” said Klinger. Klinger plans to knock on the doors of Plateau dwellers asking for tools, land or time to offer. His goal is to refresh the community, while also building garden boxes in the borough’s rare green spots. Grass to Gardens is part of a bigger project Klinger is working on called Jack of All Trades Universe, or JoatU. JoatU is a community exchange platform: a way for people who live near each other to trade, sell, rent or give their services and goods. Unlike Kijiji or Craigslist, Klinger’s plan is to focus on strengthening communities by encouraging neighbours to share things or skills. Ideally, Klinger hopes groups of people living within one kilometre of a park or community centre actively participate by making exchanges and keep the project hyper-local. For example, this means someone with leftover wall paint living near Lafontaine Park can offer it to someone who is repainting their place and also lives near the park in exchange for some unused furniture. Members of a community can also offer to give a workshop or do something that benefits others in exchange for points that can be exchanged through the JoatU system. This is similar to projects like L’Accorderie, a Quebec-based exchange system based on time, and the idealistic pay-it-forward Impossible.com. Local alternative currencies can be found around the world, but are strongest in places like Spain, which is slowly recovering from a recession that saw unemployment rates soar. Klinger differentiates JoatU from all these programs by taking advantage of online technology to create a platform—think along the lines of CouchSurfing or AirBnB. “I thought that all the other platforms were dated, they aren’t using the technology we have today in a way that can benefit them,” he said. Another important aspect is the emphasis on recognizing work that contributes to the community as a whole, rather than interpersonal bartering. It’s a simple concept, but it’s taking longer than expected to get up and running. JoatU is still under development by volunteer web programmers. The coding is up on the open source platform Ruby on Rails and can be edited by anyone interested in contributing. “Everyone working on the project is volunteering their time because they believe that a points system based on values is more important than a monetary system based on fallacies,” Klinger said. Klinger already has support from Viviane Kay of the Valhalla Movement, who has offered to give workshops on building garden boxes. Valhalla is one of the organizations presenting at Concordia’s Bite Me workshops on food politics this week. Klinger is also supported by the Coop sur Généreux, which he is a member of. 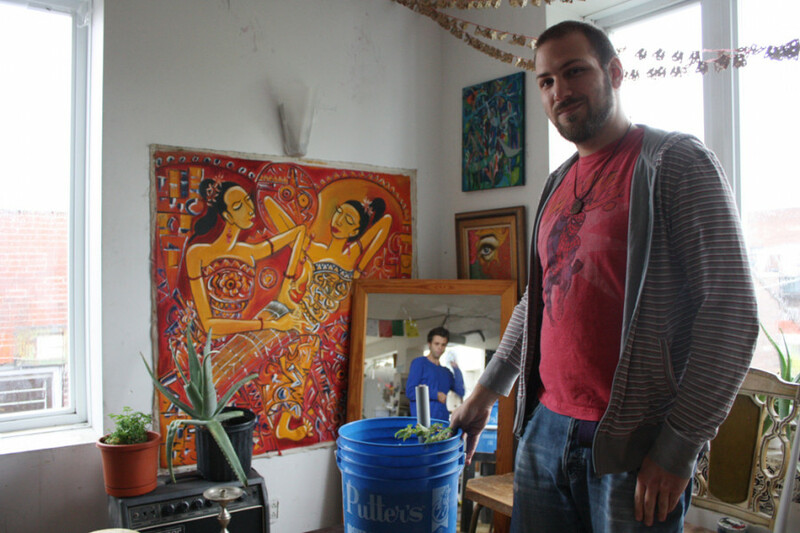 The Coop sur Généreux is a communal living space founded eleven years ago by a group of McGill graduates. Grass to Gardens is a recipient of the Get2gether Neighborhood grant, which doubles every dollar donated. Money raised will go to funding Grass to Gardens and JoatU, and a portion will be given to Cycle AlimenTerre, a group planting gardens in backyards in N.D.G. The dollar-matching fundraiser ends Sept. 22, but Grass to Gardens is always looking for tools and volunteers.